Adding hormonal therapy to radiation treatment can significantly improve the average long-term survival of men with prostate cancer who have had their prostate gland removed, according to a new Cedars-Sinai study published in the Feb. 2 issue of the New England Journal of Medicine. The regimen also can reduce the frequency of spread of the cancer, the study found. Prostate cancer is the second most common cancer in U.S. men. An estimated 161,300 new cases will be diagnosed and nearly 27,000 deaths are expected in 2017, according to the American Cancer Society. "Our study indicates that hormonal treatments should be incorporated into the management of men who need radiation therapy after surgery for prostate cancer," said Howard Sandler, MD, chair of the Department of Radiation Oncology the Samuel Oschin Comprehensive Cancer Institute at Cedar's Sinai and senior author of the multicenter study. More than 30 percent of prostate cancer patients face the return of disease one to four years after removal of the prostate gland, Sandler said. When a patient experiences a recurrence, physicians typically prescribe radiation therapy. "Our results show that adding hormone therapy could add years to patients' lives," Sandler said. The study, which included researchers at 17 medical institutions, tracked 761 prostate cancer patients in the U.S. and Canada during a 12-year period after they had participated in a randomized clinical trial of the combined treatment, from 1998 to 2003. 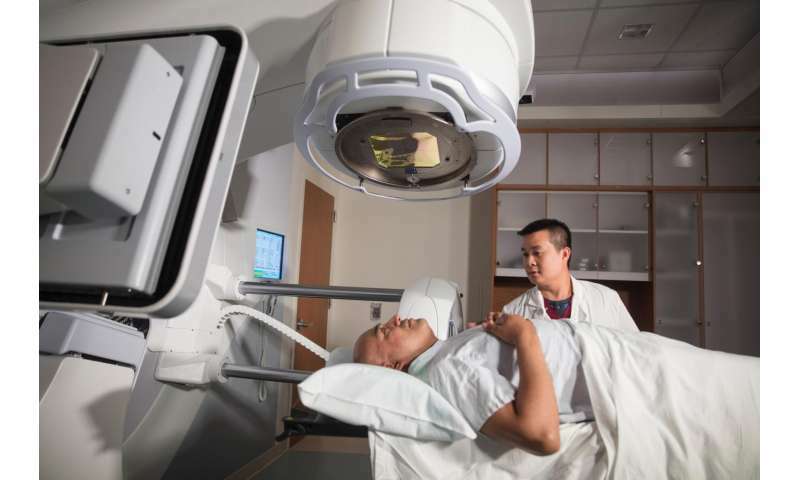 After 12 years, the incidence of deaths from prostate cancer was 5.4 percent for patients who underwent radiation therapy plus hormone treatment, compared with 13.4 percent for those who had only radiation therapy. The incidence of prostate cancer metastasis was 14.5 percent for patients who received both treatments, compared with 23 percent for those who had only radiation therapy. Side effects were low and similar in both groups of patients. The hormonal treatment used in the study was designed to suppress male hormones, known as androgens, which can stimulate growth of prostate cancer cells. Randomized study participants took the drug daily for two years. The specific drug they received, bicalutamide, has since been supplanted by another drug, GnRH agonists, in clinical practice, Sandler said. But because both drugs suppress hormone production, he said the study presents "proof of principle" that combining hormonal therapy with radiation treatment significantly reduces the rate of metastases and death in the patient group studied. "This important research addressed a significant question in the care of patients with prostate cancer, showing the continued advancement in extending a good quality of life to those patients," said Steven Piantadosi, MD, PhD, director of the Samuel Oschin Comprehensive Cancer Institute. "Dr. Sandler's leadership demonstrates how Cedars-Sinai is contributing significantly to improving the outcomes of patients with cancer." Sandler said that future studies will explore whether all or only some prostate cancer patients need hormone therapy, the duration of treatment and the role of more powerful hormone therapies.